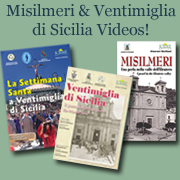 Submit your information for inclusion on the Misilmeri or Ventimiglia di Sicilia Registries using the form below. PLEASE NOTE: These registries are only for surnames from Misilmeri or Ventimiglia Di Sicilia. If your family is from a different town, or you don’t not know for sure what town your family is from, DO NOT POST YOUR NAMES! Thank You. If you have a genealogy website for your family, we can add that to your listing! Please, only genealogy sites! Please enter only surnames for families that are from the town of Misilmeri, in the Province of Palermo. Please enter only surnames for families that are from the town of Ventimiglia di Sicilia, in the Province of Palermo.